This year we are celebrating 10 years of serving the Lord as missionaries! We can hardly believe everything that’s happened since 2008! In January of 2008, Isaac did his initial training with Youth With a Mission in Costa Rica and joined staff as a full time missionary as soon as he finished in June. I graduated from college in May of 2008 and two months later returned to Honduras (where I had spent a year serving in 2004-2005) to begin my career as a missionary teacher. Over the last 10 years we’ve had the incredible privilege of sharing the good news of Jesus in 14 different nations (Mexico, Guatemala, Honduras, Nicaragua, Costa Rica, Panama, Haiti, Dominican Republic, Colombia, Venezuela, South Africa, Lesotho, Mozambique, Tanzania). When we look at the map below of where we have served and lived, what we most reflect on are the people; the stories of others that are now intertwined in our own stories and lives. The kids that we walked with through good times and really hard times. The moments when we’ve prayed with people to give their lives to the Lord, and the people who we saw develop and mature in their relationships with Jesus. We think of our own triumphs and heartaches in each location and how God has been faithfully with us each step of the way. Recently I was asked “What is the core of what you do?” It was a a really great question, because we’ve done a lot of things. At Joseph Project we ran the kids center and trained local children’s workers. In Jaco, Costa Rica we worked with kids from the slum, taught them to surf and did after school tutoring with them. In San Jose, Costa Rica we took the big Metro truck to do church services for kids who weren’t able to go to a church. In Colombia Isaac taught at a school for street kids. In Honduras I taught at a Christian school and worked with the church youth group. While it might seem like we’ve been all over the place in what we do it is because discipling people looks different in different contexts. When Jesus gave the Great Commission to his disciples, he didn’t tell them to go and simply tell people about himself. He told them to make disciples and to teach them to obey the things that Jesus had commanded them. Jesus made his own disciples through friendship. He lived life very closely with 12 people and rubbed off on them, through his teaching and example, to the point where they knew exactly how to live like Jesus. That is the core of what we do. We want to make disciples the way Jesus did. As we get to know children and youth through different activities, programs and ministries, we walk through life with them closely- through all of the ups and downs, and point them to Jesus each step of the way. The programs and ministries allow us to serve and help others in very practical ways- but they are also an outlet for us to bring the good news of Jesus in word and in deed. One of the ways God has continued to amaze us throughout these 10 years is how He has provided for us through ministry partnerships. Our organization does not pay us, provide housing, travel, nor give anything towards our living expenses. We have been fully funded through you– friends, family members, churches, people we’ve met on the journey, people who have heard our story, etc. It is truly amazing when we consider that we have lived for the last 10 years from the generosity of others. Just as our journey has had its ups, downs and changes, so have the lives of those in partnership with us. There have been times when partners can give much and when they are no longer able to give financially. We so appreciate each and every sacrifice partners make that enables us to keep serving as missionaries. With this in mind, we would like to invite you to become a partner in ministry through monthly giving, which can be set up through our new page on the World Outreach website: www.worldoutreach.org/198. We are humbled, honored and privileged to continue serving as missionaries. We don’t know all that God has in store for us in these next 10 years, but we do know that living for God is a great adventure and are excited for what is to come. My heart just about melted. Ahhhh. It feels so good to know we’re doing things right- to know that they do hear the message we show with our actions. Guess what Mama K?! (thats what some kids call me) I was with you all last night! In myyyyy….DREAM! It was the best night ever! You were my mom, and Teacher Isaac was my dad, and Makeyla was my sister. And we went out to eat, and then we went home, and Teacher Isaac was playing with me and Makeyla, and then we took baths and you told us how much you loved us and put us to bed. Then when I woke up from my dream, I felt so happy. We have hard moments at our center. But we have lots of beautiful moments too. Moments that shows us the huge difference we are making in their lives. And when God gives us those moments of showing us how much we mean to the kids we serve, it makes the sacrifice of living on the other side of the world worth it. Two days ago a scary thing happened to me. I’ve been told to expect scary things in this city. But it doesn’t make them any less scary when they happen. At 1pm Makeyla and I headed over to the center. We only live a block and a half from the center, so we walk every day. As I approached the street we have to cross, I saw several police cars and a small crowd of people. But I saw no police on the streets. At the same time I reached the corner, the police got out of their cars and drew their weapons. I froze. I didn’t know what to do. I ran across the street toward the center. Once I got to the door, I knocked and knocked and no one answered. Isaac had expected to be back by the time we had to go, and so he had the keys. I stood there at the door, feeling so incredibly unsafe. I had just run in front of a pointed gun. Why did they tell me to run? Had they meant run the other direction? Why didn’t I just run home? These are the questions we can ask ourselves AFTER the fact. But in the middle of a scary moment, it’s fight, flight or freeze. I froze and then regrettibley followed the voice of the crowd. Nothing happened to me. I am fine. I was let in the building soon after I started knocking. No shots were fired. I’m not sure what even was happening on the corner. And for some reason I have no desire to ask. Because this is a city where scary things just happen. I’ve been replying the scene in my mind over and over again. I’m upset that I was in that situation, and upset that I responded the way I did. But yesterday on our walk home from the base, I saw something that is giving my soul peace. A reminder of a promise. God is with us. I’m not alone. He is protecting us. Scary things happen, but He knows about them and He is always with me through every situation. Happy birthday: he beamed, she cried. First, a confession: we haven’t been celebrating birthdays at our center. I’ve had every intention for months to write down birthdays and start celebrating, but its just been one of those things that hasn’t happened. At the workshop last month I was challenged to show value to our kids in new ways- and so the second day we were back we made the time and wrote down all of the kids birthdays. They are now written on a birthday chart on the wall. Geneva had just had her birthday on May 1st and Mudiwa’s was on the 6th. I planned on singing to them on Friday the 6th during Kingdom Kids. Friday came and our center was full of our regular JP kids and the friends they’re allowed to invite for Kingdom Kids. One of the friends that was invited, little J, lives next door to the center and is extremely small for his age. He looks about the size of a 4 year old, but is much older. While we were doing art before the program started, I asked the kids at my table how old they all were. Little J told me that he was 10. “10?” I exclaimed,“Just a month ago you told me you were 9! When was your birthday?” “Yesterday,” he casually replied, and I gave him a happy birthday hug. Once the program was about to start, I called Little J and Mudiwa up to the front. Little J resisted and kept telling me that he didn’t do it. It showed me that the only public attention he gets is negative. But he wasn’t in trouble- we were going to celebrate him! Imagine his shock (and delight!) when I announced their birthdays and we all began to sing. I’ve never seen him stand taller! Geneva came late to Kingdom Kids, and so she didn’t get sung to. (A few days earlier, I had the kids do a writing assignment and share 5 things that make them happy and 5 things that make them said. Geneva wrote that it made her sad when people forgot her birthday. Her birthday had been that past Sunday.) So when Kingdom Kids was over, I called Geneva up to the front. I announced that she was late when we had sung to Little J and Mudiwa, but that her 9th birthday had been the past Sunday and she was so important, we couldn’t leave without singing happy birthday to her. As we started singing tears welled up in her eyes, and by the time we were halfway through the song, she couldn’t hold back anymore, and was full on crying. My heart broke for her. She’s 9 years old, and cried through her entire happy birthday song. How does that happen? How is a child so forgotten, that celebrating a birthday brings tears instead of smiles? We’ll continue celebrating every birthday of every child. Because now I realize, we might be the only people in their lives celebrating the day they were born, and singing to them that special song. It has been over a year since I updated our blog, and wow, a lot has happened in these past 12 months! (we have an 11 month baby, for example!) While I have not been good about updating here, I am very consistent in sending out a monthly email sharing about our ministry and lives in Johannesburg. So, if you want that monthly newsletter, send me a message and get added to that list. We have been in Burtingy, Switzerland (near Geneva) for the past 4 weeks participating in the Celebrating Children Workshop, facilitated by Loom International. Along with other missionaries, pastors, and caregivers from around the world, we have studied how to best serve the children in our communities. It has been a refreshing time of learning, being with like-minded friends, and hearing God speak to us about what we are doing. We’re looking forward to seeing “our” kids again next Tuesday, but it will be sad to leave this community that helps us thrive. One of the modules focused on how we as caregivers can live resiliently under pressure, and one way we can live that way is through using our strengths. Communicating with others has always been a strength of mine, and blogging used to be a tool for me to use that strength. It’s a tool I’m wanting to pick up again, because I have so many stories to tell. There are so many moments that mark me forever, but also pass me by, because I didn’t take the time to write them down. So here’s to a new goal, and a tool that will help me share life and stories, all the while giving me life and helping me to be more of who God created me to be. The army got involved with the situation on Tuesday night and began raiding different hostels where those who had been stirring up violence were staying. The army’s presence (although we have not personally seen them) has made a huge difference in ending the attacks. We are so thankful for the local and global church who have been praying, and that God is bringing peace to this city and situation. Over the weekend almost every shop on our street was closed- all run by foreigners. The nights were quiet, too quite for what is normal. There are helicopters that are circling the city almost couple hours, which makes us wonder what they are doing, what they are seeing. Occasionally we would hear a gunshot, but they were random and nothing compared to Thursday night. Attacks have continued and spread to other regions of Johannesburg. A man from Mozambique was murdered over the weekend, and is said to be the 6th person killed in these attacks, however, many deaths and xenophobic activity are not being reported in the news. I’m shocked every time I open the news here and see that other stories are making the headline news, and not the reality of what this country is going through. People are on edge, myself included. Kids are not going to school. I asked a group of kids playing in my apartment building if they went to school on Monday. One boy spoke for the group, “We went to school, but he couldn’t go.” “Why couldn’t you go?” I asked the boy who had been pointed to. “I can’t go because of xenophobia. I’m from Angola.” The numbers are down at our center for children. One 7 year old girl didn’t go to school, but came to our programs because she feels safe with us. “Why didn’t you go to school,” I asked her. “Because of Xenophobia,” she replied. “What is xenophobia?” I asked her. “It means they are killing all the children,” she told me. It’s so sad to hear how the kids are living in fear of even going to school. Although the physical violence in my immediate community has slowed way down, the emotional terror these attacks are having on people are very real, and very alive. Shops are closed, money is not made, families are not eating, kids are not going to school, people are hiding in fear, etc. The thing with these attacks, is that they can start anywhere at any moment. My friend’s sister was in the downtown area catching a bus home and 2 guys asked to carry her bags for her. She politely said no she could carry them herself, and then they started shouting at her, “Why are you speaking to us in English? Speak to us in Zulu!” Very quickly a crowd formed, and they were all shouting at her for speaking English and not the other language. She started running and jumped into a bus that was coming. But it was a matter of seconds that the crowd formed, and guys who were trying to rob her bags created an issue about her not being a native South African to incite others who were listening. We are still in our apartment, serving with the Joseph Project daily, listening to stories from others, and assessing the situation. A peace march in Johannesburg will happen on Thursday. We will not participate, but several of our friends are planning on going. Please continue to pray for peace in our city- for emotional peace as well as physical peace. South Africa has been in the international news the past several days because of xenophobic attacks against foreigners. The attacks started in Durban, and last week spread to Johannesburg. The attacks are mostly against black foreigners from other African countries. Thus far, 6 people have been killed and many injured. We live in the downtown area of Johannesburg, and unfortunately our community has been targeted. Our community is full of foreign owned shops, and people from neighboring African countries. On Thursday night a mob of people came down our street smashing in foreign owned shops, looting, and firing bullets. Neither Isaac or I have ever been in a war zone, but the bullet fire sounded like we were in a war. It lasted from about 9pm to 2am. Many people who live in our apartments are from Mozambique, Zimbabwe, Angola, and other African nations. Residents left in the middle of the night, afraid for their safety. On Friday we had to finish our children’s program early when a mob started coming down the street, burning tires and terrorizing people. The attacks have spread to other areas of Johannesburg, despite the increased police presence. African migrants are asking to be repatriated, and are going home in busloads. We read in the news that 1,500 Zimbabweans have already returned to their home country. Because we live on the 4th floor of our apartment building and our building has a ‘no visitor’ policy because of these attacks, we feel safe in our home. However, if things escalate and we are no longer able to stay in our building, a few friends who live in other regions have invited us to come stay with them. We hope and pray that it will not be necessary to leave, but we will be ready if that is the case. Please pray for us, our safety, and that we will have peace in the middle of this storm. Pray for our neighbors, the children we serve, and the community we live in. Pray for police to protect all people, and to not act corruptly. Pray for the xenophobic acts to stop, and for peace between the South African and non-South African people. It seems as though everything in life has a story. I’m not sure if it’s because I’m living in a different country, or if it’s just me, but there are always several steps between point A and point B. So today I want to tell you the story of buying our car here in South Africa. It has been quite the feat, and we are thanking God today that we have a car, in our name, both able to drive it, and that we are no longer using public transportation! After looking for months online, we realized that our best bet at getting a reliable car was through a dealership. If we were to buy from a private owner, we might get a better deal, but there was no guarantee of the quality/condition of the car. We went to several dealerships, and found a 2005 Kia Sportage. It seemed like the perfect car for us! (We didn’t care about the make or the model, but we wanted a car newer than 2005 that was SUVish) It had just come to the dealership, and when we test drove it everything seemed great. We told Fred, the car salesman, that we wanted it, and then started the paperwork. It needed a few repairs, so Fred told us to put down a 50% deposit, and when the car was in perfect working order, we could come and pay off the rest of the car. 2 days later (and much to our disappointment) Fred called us and told us that he was not willing to sell the car to us. The gear box had a lot of damage to it, and he could fix it for the moment, but it would cause a lot of problems throughout the life of the car. He told us that we needed to come back to the dealership to get the full refund, because his conscience wouldn’t allow him to sell that car to us. Amazing, right? Our friends here were astounded at Fred’s honesty. Car salesmen here are not known for looking out for the client- they are known for looking out for their own pocket. We received our full refund, thanked Fred for his honesty and integrity, and continued the search for our car. A few weeks passed, and we decided that if we hadn’t found anything by the end of January we would settle for a smaller vehicle. It was a challenge to find what we were looking for within our price range. A friend of ours was taking his car in to get serviced, and it was in an area with lots of car dealerships. He offered to take us with him, and help us look around. We went to several dealerships but found nothing that was worth investing in. We decided to go to just one more dealership before we went back home- the Nissan dealership. Hashim, the salesman, was quick to greet us and said that yes he had 1 car that fit what we were looking for. He showed us a Nissan Livina, which is like a glorified station wagon. It was nice, had low milage, and was within our budget. Isaac was a little reluctant, which Hashim noticed. 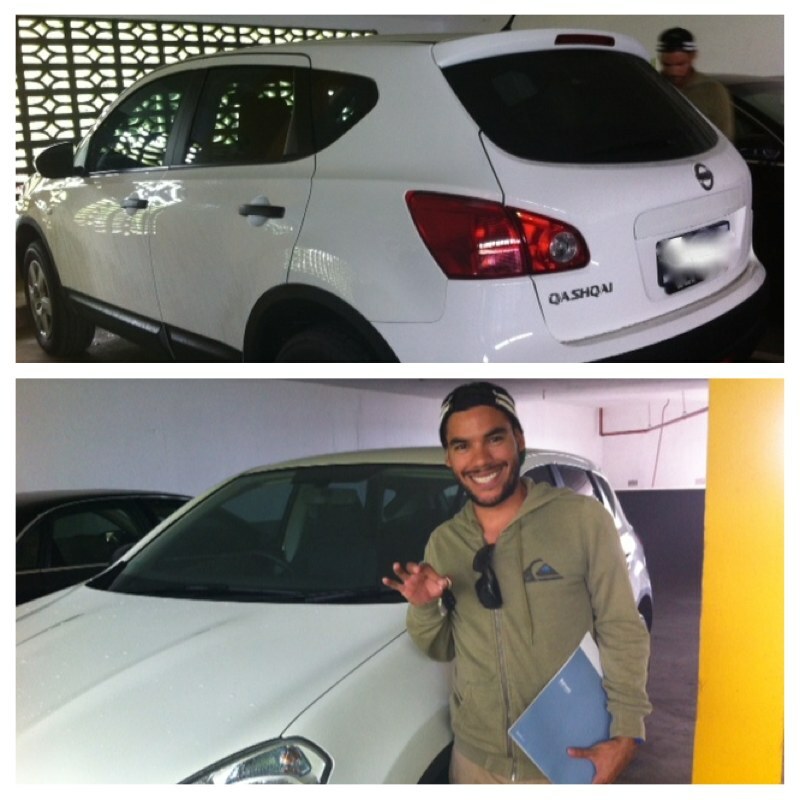 Hashim then mentioned that a Nissan Qashqai had just (as in within the last 10 minutes) been sold to the dealership. It was 2008 and had been bought new from the dealership, and now the owners were leaving the country so they were selling it back. There were only 45,000 miles on it, and it was in perfect condition. It was also within our budget. Our South African friend who was with us couldn’t believe the quality of the car for the price it was being sold at. We took it for a test drive and decided, yes this is the car we want. Hashim told us, “You guys must be really lucky people, because this car isn’t even the system yet since the dealership just bought it. I know plenty of guys who work here who will wish they would have seen it before you!” We told him, no we’re not lucky people, we’ve prayed and we know that all good things come from God! He is Hindu, so that comment kind rolled off him. We sat down to do the paperwork and they asked us for out South African Id or Traffic Registration number so the car could be registered in our name. We told them that we didn’t have either, and we were informed that we could put the deposit on the car so that it wouldn’t be sold to anyone else, but that we needed that number (and car insurance) to be able to take the car from the lot. We paid for half of the car and left, now with a new mission of getting that number. The traffic reg number can take a few weeks or several months to get, depending on where you get the number. We heard that a certain location gave numbers in 5 days, and so a friend took us to that department. When they checked our home address, we were told that we were not eligible to get a number at their location, because we didn’t live within their region. We had to go to the department in our region which has a reputation for taking up to 3 months. Hashim called us the next day and said that the dealership had someone from the traffic reg department that helped them, and that she would be calling me soon to help us get it done quicker. Hashim also said that he would love the opportunity to get to know us out of a business setting, and so we have a pending dinner invitation with him and his wife! Vilma, the traffic lady called soon after and told me to meet her at the traffic reg department in our area the next day. Before she hung up she said, “wait, I haven’t even asked, how are you getting there?” When I told her we would be going by taxi she said, “Ugh, don’t waste my time! You’ll be late and I’ll have to wait the whole day. Better I just come and fetch you. Give me your address and I’ll pick you up at 8am tomorrow.” What a huge blessing!!! It was funny to Isaac and I, that the possibility of us arriving late because we would be arriving in taxi was a waste of her time, and she preferred to pick us up! The next morning she picked us up and took us to the department. On the way she poured her heart out, telling us about her daughter’s drug addiction, the struggle of raising her grandchildren, her employe that had stolen money from her, etc. It was an amazing opportunity to minister to this lady! Once we got to the department and I submitted the paperwork I was told that I could come back in 2 weeks to pick up the number. 2 weeks is a whole lot better than 3 months!!! We called the dealership to let them know when the traffic reg number would be ready, and for them it was completely unacceptable. They didn’t want a car that was already sold sitting on their lot for 2 weeks. They did paperwork to allow us to take the car as a rental car, so that even though it was ours, it was under the dealership’s name and we were able to drive it in the city. The only requirement for that is that we would need to have the car insured under our names. We were able to get that (which is another long story for another day!) and then pick up our car. Vilma came for us 2 weeks later and took us to pick up that number. She, Fred and Hashim are just a few examples of how good the people of Johannesburg have been to us. Something that we have seen again and again, is how willing Joburgers (people from Johannesburg) are to go out of their way to help others. The last step of this whole car ordeal was Isaac’s license. The one thing we did not think about when moving to South Africa was translating his license from Spanish into English. His license is not valid here unless it is officially translated into English. This means that I’ve been the one driving- stick shift with my left hand on the other side of the road. It’s been quite the challenge. Finally, today, Isaac received the translation of his license. I’m not sure whose happier- me to not have to drive anymore or him as he finally gets to drive!! Either way, we’re both happy campers!